When that whole crispy rendang incident was playing out, I really wanted to see if it would be possible to create actual crispy rendang. After much deliberation, I thought the best way to achieve this would be to take the meat and sauce from a chicken rendang, and use it as a filling for spring rolls! So yes, I went through the whole rigmarole of making rendang from scratch, just so I could make these spring rolls. And while I made these crispy rendang spring rolls as a joke, I'm pleased to say they didn't taste like a joke. They were fantastic! 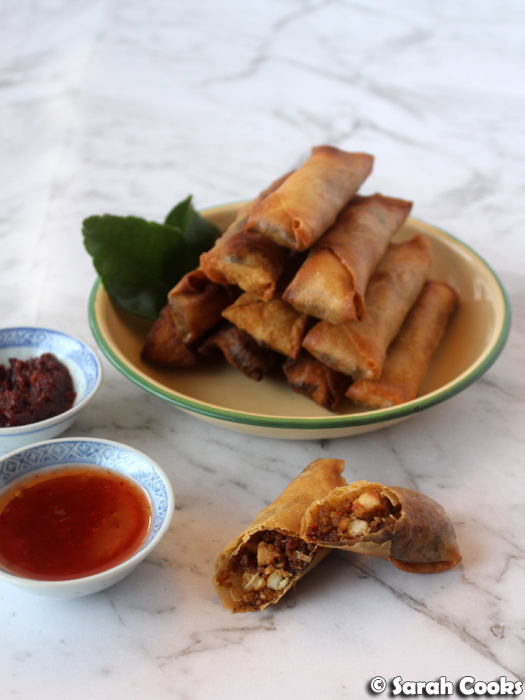 Once you've actually got your rendang, making these spring rolls is pretty easy. (I wouldn't recommend making it all on the same day, unless you have lots of time and are feeling very energetic!) In fact, the hardest part of the whole exercise is peeling apart the spring roll pastry! You start by removing the meat and skin from the bones - and I'd suggest doing this by hand, but make sure you wear food gloves! Then finely chop it with some of the sauce. I like a ratio of about 70% meat to 30% sauce, but this will depend on how much you have left over. For funsies I actually made a few spring rolls that were all sauce, and they kept their shape, so it's ok to go for a higher ratio of sauce. And here's how you roll the spring rolls. I hope this picture is helpful for any spring roll novices out there - I once read a recipe in one of my mum's books that had no pictures and simply said: "Roll the pastry spring roll style". Cool, thanks. Another tip is to brush the edges of the pastry with a mixture of cornflour and water to help seal them. I don't deep fry often, as it can be a bit of a hassle to dispose of the oil, and it can stink up the house if you don't have a good exhaust, so when I do deep fry, it has to be worth it. These spring rolls were definitely worth it. All the wonderful complex spices and aromatics of a rendang, in an easy to eat and crisp little package. Serve the cooked spring rolls with sambal belacan or sweet chilli sauce, they are crazy delicious. Crispy rendang for the win! Allow the spring roll pastry to defrost according to packet instructions. I usually put it in the fridge for a few hours before cooking. To prepare the filling, remove the bones from the leftover chicken and discard. Roughly chop the meat and skin. (Note: the skin will not be crispy; this is ok). Mix the chopped meat and skin with some of the leftover sauce, you want a ratio of approx. 70% meat and 30% sauce, although this will obviously depend on how much you have leftover. Set aside. Remove the spring roll pastry from the packet, and cover with a clean damp teatowel while you make the spring rolls. For each spring roll, take one piece of pastry and place it on a board in front of you, with one of the corners pointing towards you. Place a tablespoon of the filling mixture on the pastry, just below the horizontal centre. 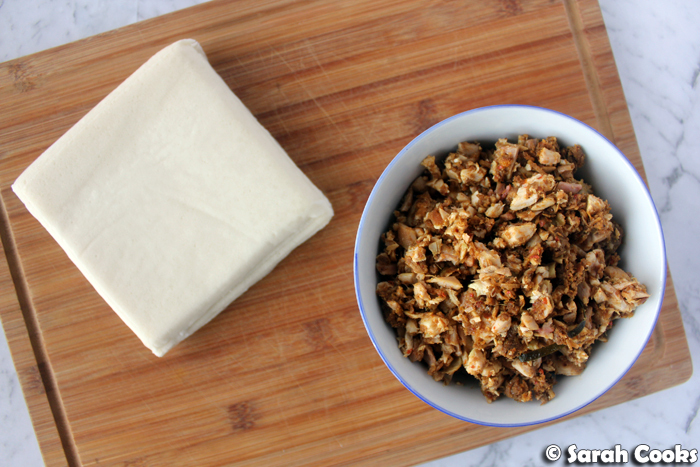 Roll the bottom of the pastry over the filling, then roll it over once to enclose the filling. Fold the right and left sides in, moistening the pastry with a little cornflour-water mixture to seal. Continue rolling the spring roll to form a little tube, sealing the tip with more cornflour-water mixture. (Look at the pictures above for a guide). Repeat until all the filling is used up. Heat a few inches of vegetable oil in a wok or heavy-based saucepan until 180C. 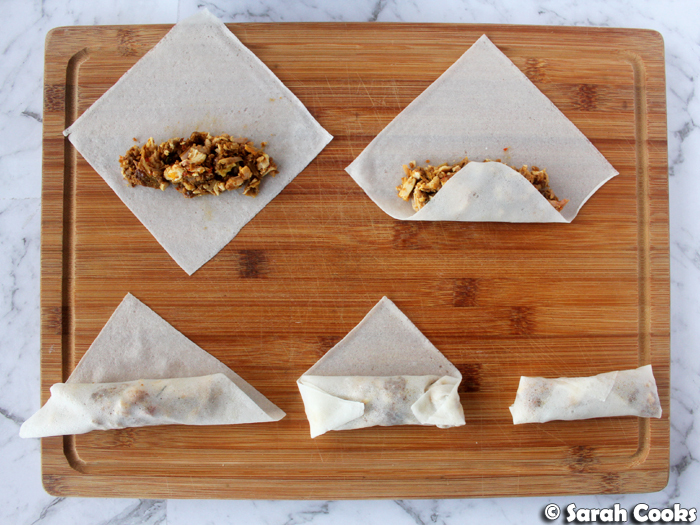 If you don't have a thermometre, sacrifice one sheet of spring roll pastry to test. The oil should bubble up around the pastry as soon as it hits the oil, and it should take a minute to turn a nice golden brown. 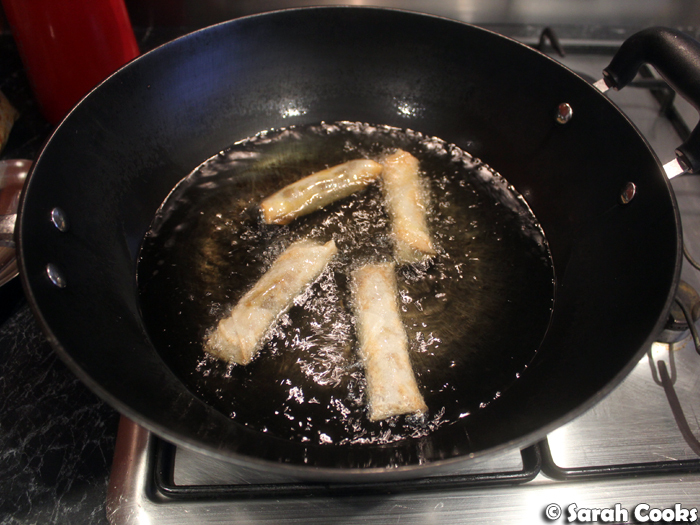 Fry a few spring rolls at a time, being careful not to overcrowd the pan. Fry for a minute or so on each side, or until golden brown. Remove the spring rolls and let them drain on kitchen towel. Repeat until all the spring rolls are cooked. Amount you get will depend on the amount of leftover chicken rendang you have. Love the spring roll 'how to' photo. I have never made spring rolls but if I do I will be referring to this picture :) These sound delicious. Yesssss! I'm so glad you found it useful!